As the foundation for Enterprise Networks, Cisco 4500 Switch provides high-performance, mobile and secure user experiences through Layer 2-4 switching to meet current and future network demands. Its centralized, innovative, and flexible system design helps ensure smooth migration to wire-speed IPv6 and 10 Gigabit Ethernet (GE). The forward and backward compatibility between generations of the Cisco Catalyst 4500 Series extends deployment life, providing exceptional investment protection, while reducing the (TCO). The Cisco 4500E Series is a next-generation extension to the Cisco 4500 Series. 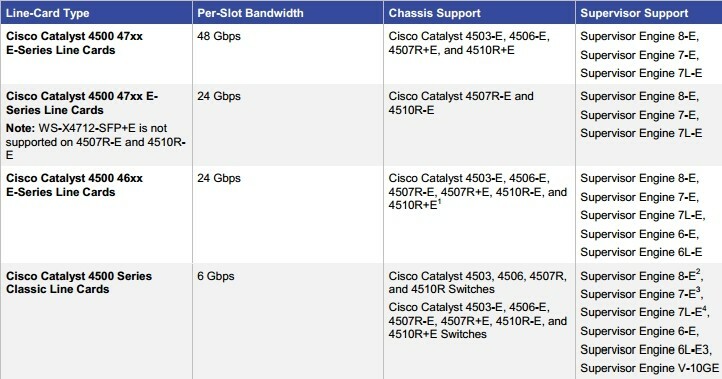 The new Cisco E-Series is composed of the Catalyst 4500E Series supervisor engines, E-Series line cards, and E-Series chassis, which are designed for a high-performance, mobile, and secure user experience with superior backward and forward compatibility, delivering exceptional investment protection for organizations of all sizes. The Cisco 4500 Series offers two classes of line cards: E-Series and classic. E-Series line cards provide 24 or 48 Gb of switching capacity per slot. 24 or 48 Gb per-slot switching capacity requires the Cisco Catalyst 4500 E-Series chassis and the Cisco Catalyst 4500 E-Series Supervisor. Classic line cards provide 6 Gb of switching capacity per slot. Classic line cards may be deployed in both classic and E-Series chassis with either classic Cisco Catalyst 4500 Series supervisor engines or with the Cisco Catalyst 4500E Series Supervisor Engine. The following table summarizes the chassis and supervisor support for both classic and E-Series line cards. 1Slots 8-10 on 4510R-E and 4510R+E chassis do not support E-Series line cards with Supervisor Engine 6-E.
2Supervisor Engine 8-E does not support non-E-Series chassis: 4503, 4506, 4507R, and 4510R. 3Supervisor Engine 7-E does not support non-E-Series chassis: 4503, 4506, 4507R, and 4510R. 4Supervisor Engine 7L-E does not support non-E-Series chassis: 4503, 4506, 4507R, and 4510R.